Our Soytanicals Line offers finished products designed for easy resale. Beyond our basic line, we can work with your company on your own private formulations that bear the Soytanicals label. Private customer formulations will only be available to the customers who desires their own unique formulas and will be protected under contract as their own intellectual property. These products are offered at wholesale prices in easy to afford lots, and offer a high profit margin for resale. Our basic line focuses on the most indispensable body care needs and use only the highest quality ingredients. Natural Wax Jelly: A natural and excellent alternative to Vaseline, KY, or any type of lubricating agent. Made with high-quality fractionated coconut oil (Fractionated coconut oil does not have a coconut smell) and white beeswax. It is a beautiful clear jelly. This Jelly is also a great base to add a few essential oils if a user needs to target a certain salve. This jelly is a must in our bathrooms and has a long shelf life. Packaged in a 4 Ounce double walled jar with dome lid. Wholesale units are $4.00 each, in lots of ten. 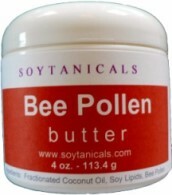 Bee Pollen Butter: Without question, this is one of the most healing of all butters. Made with Fractionated coconut oil and bee pollen, this butter needs no preservatives. The butter has a slight natural orange color and honey scent. It is great for those with chronically dry hands, such as nurses, or superficial skin wounds such as tattoo post care. Packaged in a 4 Ounce double walled jar with dome lid. Wholesale units are $5.00 each in lots of ten. Shea Butter: This is 100% pure refined shea butter. Shea Butter nourishes the skin with Vitamins A, E and F. Vitamins A and E help maintain the skin and keep it clear and healthy. They are particularly helpful for sun damaged skin. They help prevent premature wrinkles and facial lines. Vitamin F acts as a skin protector and rejuvenator. It soothes rough, dry or chapped skin and helps soften dry or damaged hair. 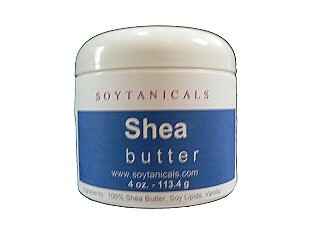 Also, Shea Butter easily penetrates the skin allowing the skin to breathe and not clogging pores. 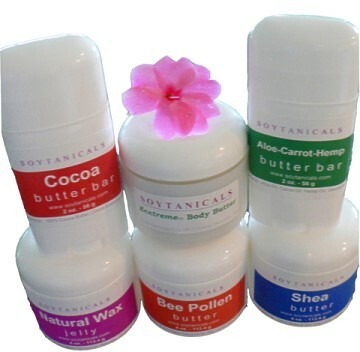 Shea Butter is also considered to have natural sunscreen properties. Shea Butter is also anti-inflammatory, making it useful in treating rheumatism. Our Shea has a slight vanilla scent. Packaged in a 4 Ounce double walled jar with dome lid. Wholesale units are $4.00 each in lots of ten. Cocoa Butter Body Bar: This is 100% pure cocoa butter from the finest source. Soothing, Softening, Relaxing, Indulging. It is great for preventing stretch marks and can even be used to make the lips supple. Cocoa butter is very moisturizing. Cocoa butter is a yellowish fatty acid obtained from the cocoa seeds and used in cosmetics, chocolate and soap. Packaged in a convenient 2.5 Oz white twist tube. Wholesale Units are $2.95 each in lots of ten. Aloe-Carrot-Hemp Body Bar: Made with Candelilla Wax, Aloe Oil, 100% cold pressed carrot and hemp oils, this bar is perfect for those who love to tan or need slight after-sun care. Green in color with a carrot scent. Packaged in a convenient 2.5 Oz white twist tube. Wholesale units are $4.95 each in lots of ten.